Assigned to the 5th Air Force, 43rd Bombardment Group, 403rd Bombardment Squadron. Nicknamed "Bunny Hop" and later "Flying Wolf". The upper corners of both tails were painted white. 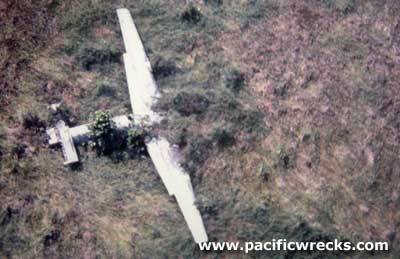 On December 23, 1943 took off from Horanda Airfield near Dobodura on an armed reconnaissance over Wewak. Over the target, this B-24 attacked a freighter off But and was intercepted by two Japanese fighters that shot out the hydraulics, injured two of the crew and caused other damage. It was unable to return to base and instead force landed at Faita Airfield. Without hydraulics, the B-24 skidded to rest with the nose wheel collapsed or sunken into the runway and the tail pointed skyward. During the war, it was stripped of usable equipment and later the fuselage cut into two pieces. The rest of the wreckage remained in situ until the late 1990s. In the late 1990s the wings of were recovered by the B-24 Liberator Restoration Fund and used in their restoration of B-24M Liberator A72-176 at Werribee Airfield. 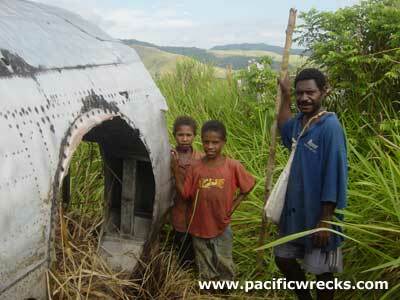 "I visited this wreck in August 2004, it did not look much like an airplane anymore. The tail and wings were removed, and the waist section was cut into two pieces - top and bottom halves and remain. The cockpit section remains, but had been gutted either during the war or by the recovery team."